This is a method to teach your dog to lie down at a distance and to lie down when he/she is running. Before you start, your dog should reliably lie down on multiple surfaces and in multiple locations when you are standing next to him/her. Fast downs require that the dog knows how to down from a stand and not just from a sit. If your dog will only down from a sit, teach a down from a stand before proceeding. (Please see the training manual for information on teaching a dog to down) When training fast downs and downs from a distance, it is very important to use the clicker. The clicker signals the instant the behavior is correct. By the time you manage to deliver the reward, many seconds may have passed. Without the clicker, the dog will be unsure which behavior is being rewarded. As you train for speed, gradually raise the criteria by not rewarding slow downs. When the dog is dropping at a distance, you should go out to reward the dog or toss the food to the dog. For dogs that are toy oriented, toss a ball over the dogs’ head and send him/her to get it. This helps keep it clear that the dog is to drop at the current location and not come in towards the handler and then drop. When I teach this exercise, I do not always call the animal’s name. When using it to stop a dog running towards danger, use your pet’s name. 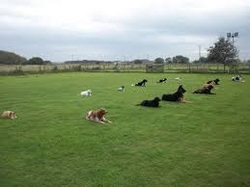 With practice most dogs will more reliably drop than recall in an emergency situation.